Megan (and her husband James) have been hard at work transforming the basement apartment of the store into a swish dye studio! I’ve been down there dyeing yarns for the store for awhile now, but over the last couple weeks it’s really been transformed – it was a touch sketchy before, also, orange. And there was a fridge. Why the new space? Why, workshops of course! I’ll be teaching dye workshops in wool/protein fibres and cotton/plant fibres all fall, pretty much every weekend (except Rhinebeck weekend – speaking of which, anyone need company?). Each class except for the handpainting cotton workshop is one session, three hours long. We’ll cover everything – safety, math, and different dyeing techniques. It’s definitely a cozy space, so each class is limited to three people, at least for the time being. Once you’ve taken a class, you can even sign up for studio time and use our facilities to do your own thing! The class schedule isn’t up on the website yet, but keep an eye out and it will be shortly. If you’re itching to find out more, email me and I’ll forward you the full schedule and details! 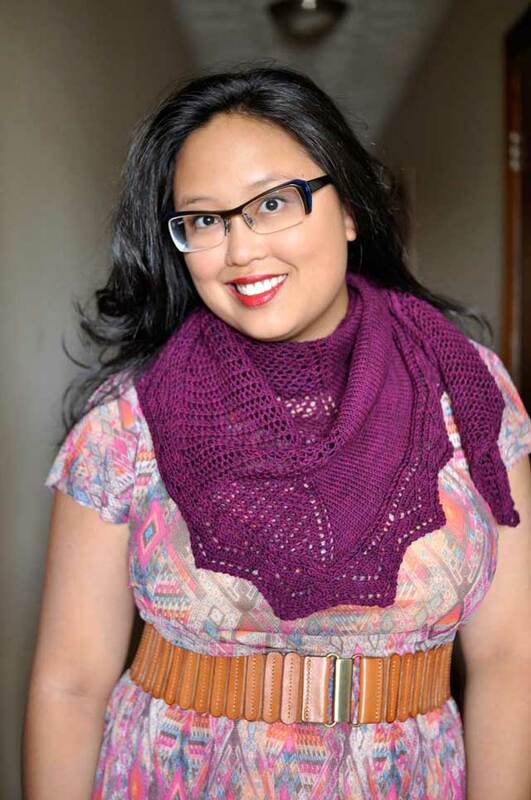 Yet another post that makes me wish that Lettuce Knit was my LYS! Do you have any more tantalizing news about your hand-dyes or pattern support? I’ll echo those “why don’t I live in Toronto” sentiments. As if there weren’t enough reasons, already. The biggest thing keeping me from dying is space/facilities issues. If I lived there, I’d be there in a second. On 27 June you posted a couple of photos of a lovely cardigan in bamboo rib. I have been eagerly looking out for more but it hasn’t been seen again – can you tell us the stitch pattern meanwhile, or do we have to wait for the cardi pattern to be available? I saw the space in person on Sunday and immediately signed myself up for a class – what a great place to play! This looks like so much fun – why don’t you live anywhere near me?!?! It looks great – envy, envy. Was just talking yesterday to someone ho wants to learn how to dye but can’t think WHERE she could learn. Long commute though. i think i might try to take your workshops!! even if it means driving in toronto, which scares the crap out of me. also, re rhinebeck- i am totally planning on going, and staying with jaya- do you want me to see if you can crash too? we could go together then! That is SO COOL! I want that in my house! That looks like fun – wish I could join! I wish Lettuce Knit was my LYS, too!!!! Or at least I wish my LYS would do this – it looks absolutely amazing!! 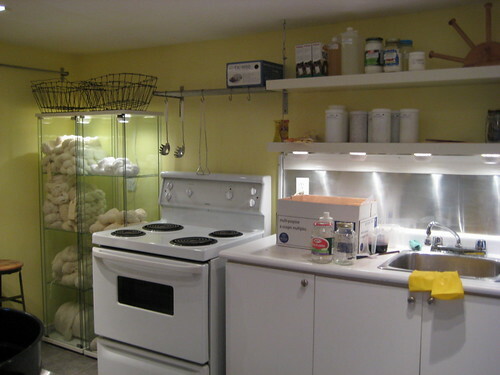 I would love to dye, but my apt kitchen is….hmmm…. a wee bit small for such a project – this is the perfect solution! Man, I wish my 3000 s.f. house were bigger! My mouth is watering. I just bought some osage orange chips to dye a yummy acid green with at Stitches Midwest. Do you like Americans in Ontario? I was watching the F1 race and wondered if I should go up there. Wow! Every would-be dyers dream! Confined in my tiny apartment, I have to wait until we own to foray into the wonderful world of dying. Wish I lived a bit closer…Have a great time with your classes! That looks amazing. I wish I could sign up! Yay, how cool! I love teaching workshops, though I teach them about technology, not about dyeing, which must be even more fun! Oh! Oh! I am in Mississauga. I will definitely be interested in coming to the class. Could you please e-mail me the schedule? That is so cool. Wish I could take a class from you. I want to learn how to dye and spin. This? This is why I love that Lettuce Knit IS one of my LYSs. 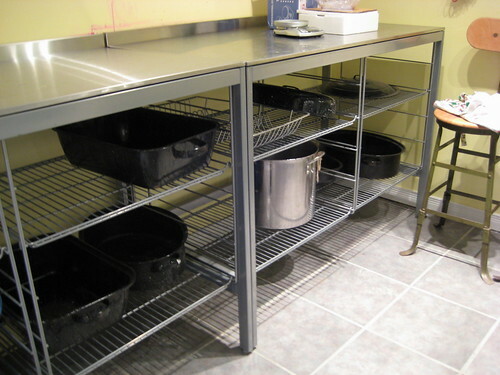 A dye studio. In the basement of the yarn shop. You guys rock so, so much. Is Toronto actually the knitting capital of the world, or is that just my perception? I was on vacation in Jamaica recently and ran into a couple from Toronto. They had no idea why I was so excited and wanted to hitch a ride in their suitcase. I tried to explain the whole knitting thing, but they started to look scared and edge toward the door, so I stopped. Sadly, I live in San Diego, which is great for many things, but not so much for knitting. Wool is an exotic rumor around here. Ah, well. I do hope you enjoy the new studio. I will have to enjoy it semi-vicariously, by buying your yarn! This post is the best ad I have ever seen for a yarn shop. Its so clean and just screams potential with that beautiful glass cabinet of waiting-to-be-dyed-fibre! I think I’ll move my next planned trip to Lettuce Knit up in the calendar a bit!